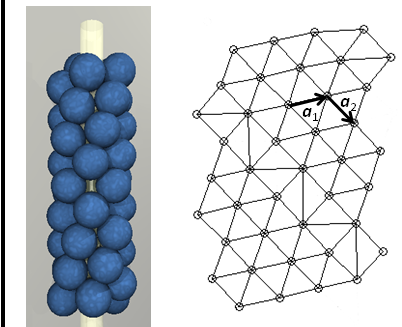 We have recently published a paper on packing spheres on the surface of a cylinder. The last twenty years has seen a flurry of activity understanding crystallization on surfaces with Gaussian curvature, especially a sphere and, more recently, the catenoid. On such surfaces, the Gaussian curvature acts as to disturb the orientation of the crystals, forcing them to incorporate defects. On a cylinder, there is no such obstruction. Yet, the circumference of the cylinder may not be commensurate with the lengths emerging in a crystal. When the particles repel, there seems to be one scenario – the crystals rotate relative to the cylinder axis and the crystals stretch uniformly. When the particles attract, however, a third possibility can be realized — the crystal separates along a seam. When this occurs can be predicted with startling accuracy from a simple model. Derek Wood, C.D. Santangelo, and A.D. Dinsmore, “Self-Assembly on a Cylinder: A Model System for Understanding the Constraint of Commensurability,” to appear in Soft Matter (2013). New postoc, Vincent Demery, arrives!